In 1972 Card. Karol Wojtyla wrote the book Toward the Sources of Renewal commenting on the documents of Vatican II. 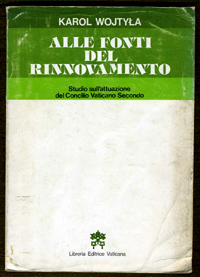 In 1981, after he was elected Pope, this work was translated into Italian and re-published by the Vatican Library. At right is the cover of this Italian edition. Below, we present our English translation of the text highlighted in yellow. 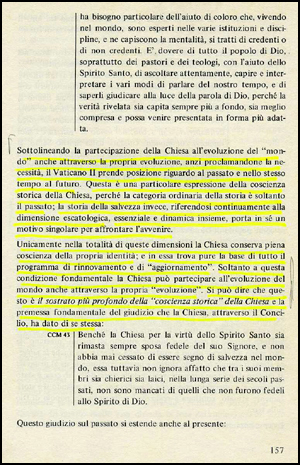 Underscoring the participation of the Church in the evolution of the world through her own evolution, and proclaiming the necessity of this, Vatican II took a position regarding both the past and the future. This is a special expression of the Church's historical conscience. The ordinary criterion of history is only the past; the history of salvation, however, by continuously referring to the escatological dimension [the end times dimension], which is essential and dynamic, bears in itself a unique motive to face the future. Only in the totality of this dimension does the Church conserve a full consciousness of her identity; and in it she finds the basis for a complete program of renewal and aggiornamento. Only with this fundamental condition does the Church participate in the evolution of the world through her own 'evolution.' One can say that this is the deepest substratum of the Church's historical consciousness, and the fundamental premise of the judgment that Church, through the Council, has made about herself.